Home / IOS / How Accurate is Find My iPhone? Find My iPhone Accuracy – If you’ve lost your iPhone and you are trying to locate it using either the Find My iPhone application on another iPhone or logging in to the web via iCloud you may have noticed that sometimes the accuracy of your iPhone’s location can change. You may also notice that sometimes there is a big green circle around your iPhone’s location. 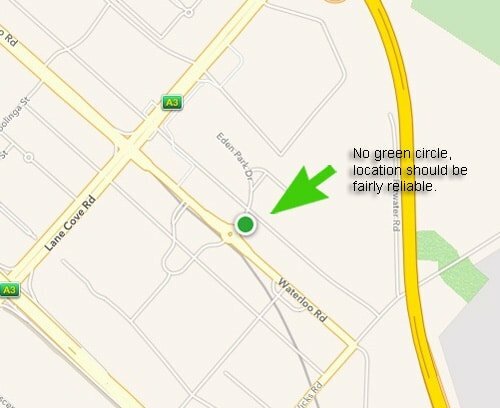 So what does it mean when there is a large green circle around the iPhone’s location? Essentially it means that the iPhone’s location is approximate. The larger the green circle the more approximate it is. In the example above this iPhone was inside our office. It’s a six story office complex and the phone was placed in an office without any direct line of sight to a window. The image with the large green circle around it was taken after we turned off Wifi on the device. Why does it make a difference if Wifi is turned off? Find my iPhone makes use of the inbuilt GPS and your Wifi when determining the location. What happens when Wifi is turned off is that it is only relying on one piece of information instead of two to locate the device. When you’re inside a building or there is any sort of interference, Wifi helps quite a great deal in pinpointing your iPhones location. The accuracy of Find my iPhone will depend on a number of factors including interference, the GPS signal and whether Wifi is turned on. 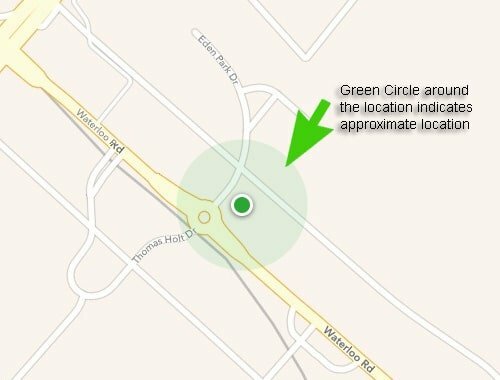 The size of the green circle around your phone’s location will give you an indication as to how accurate that information is. It’s also important to note that if your phone is sleeping, Wifi may be disabled which will probably mean you will see a green circle more often than not. iPhone location app was 60 – 75 feet off. At 1:30 AM, I woke up and discovered my iPhone was missing so after checking everywhere including my car, I pulled out the iPad Air and the location app. Curiously, the green dot appeared without a halo indicating my next door neighbor had the phone. So, I walked outside to make sure the location was correct. I was really disturbed as I walked back and forth along the street to make absolutely sure the phone was in my neighbor’s house and for ten minutes the green dot didn’t budge. I was also using the sound option in the app which causes a sound to be emitted by the phone. I waited to see if a light went on in my neighbor’s house… Nothing. So I began to lock the phone… And at the last minute I hesitated and went back in my house thinking of the implications that just didn’t make sense. I just couldn’t believe my neighbor swiped my phone. As I opened the door to my house, I heard an unfamiliar sound… Turns out it was that alarm sound the app causes the phone to emit when you select to do so in the app. After some careful re-looking around, I found my phone lodged in the recliner mechanism of the chair I feel asleep in. Imagine you did trust the location tho. storming into your neighbors’ house close to midnight . . . Waking them up . . . Looking like some deranged thief/murderer . . . accusing them of stealing your phone. This happened to me tonight… neighbor thought I had their ipod. Called the police. 1:30 am. Seriously? Threatened us.. bullied their way in to search. Surprise surprise.. no ipod found because we don’t have it. Our rights? Violated. NOT accurate. I had the same situation happening. People coming at my door saying their phone is at my house when I do not have it. I tested the location on fine my own phone and it’s off, it shows the phone is at my neighbor’s house. Is there any way to deal with this? The neighbor next door kids are bad kids, and police have come often, chances are their phone is with them based on my tested experiment and knowing these kids stole in our neighborhood. wife having an affair based on the location of IPhone…but still cannot confirm …supposed to be at the gym but phone shows at an apt complex a quarter of a mile away…Is the iphone that inaccurate??? Well well I was mad today while I was chucking some ones where about and find my iPhone indicates me in one one of the restaurant near by and l did refreshed it two three times no change at all was lucky not correct. Everything you just said is what I’ve been going through for about 6 months now. The worst is when I’m in the garage (which is often), because the WiFi signal is terrible so the map leads her to believe that I’m always at the neighbors house and we are sleeping with each other. I’ve never even met the neighbor. One day she is going to go there in a psycho rage, confuse & scare the neighbors, and get herself arrested.